Invasion! 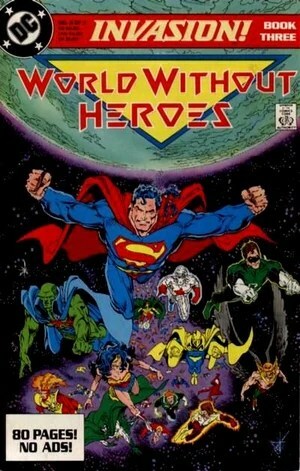 was a three issue limited series published in late 1988-early 1989 by DC Comics. 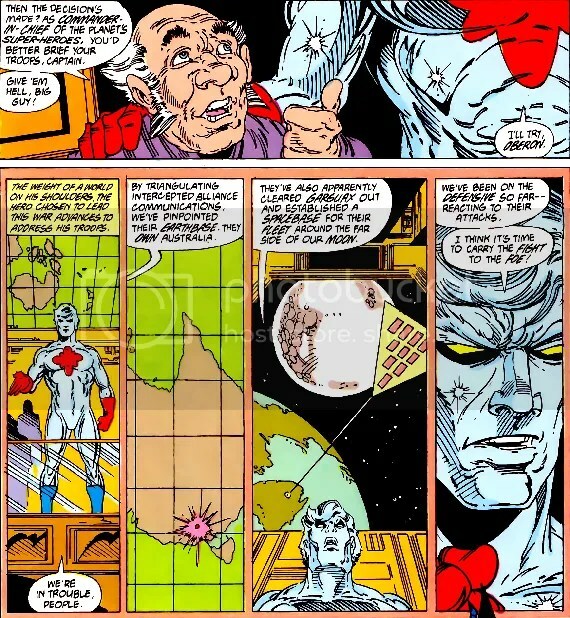 It was plotted by Keith Giffen, and ties up a great many plot lines from various Giffen-created DC series, including Omega Men, Justice League International, and Legion of Super-Heroes. 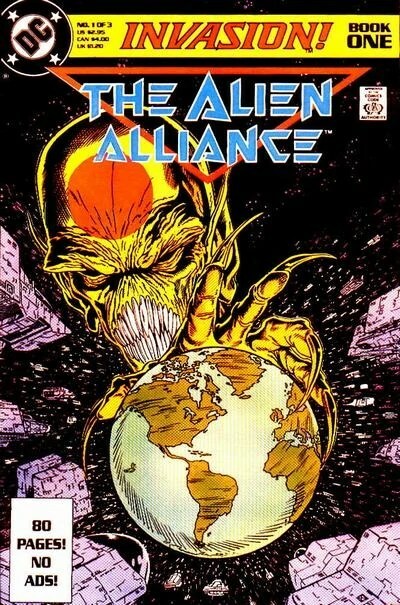 In this crossover event, the Dominators have put together an Alliance to invade Earth and eliminate the threat posed by their unpredictable “metahumans” (secretly, the Dominators wish to harness this and breed their own army of metahumans, but this goal is kept from the rest of the Alliance, and from some of their own race). After assassinating many former members of the disbanded Green Lantern Corps, and attacking the Omega Men, the Alliance launches a massive attack on Earth, overrunning Australia and establishing there a base from which to conquer the rest of the planet. 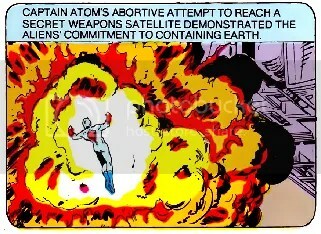 Captain Atom figures prominently in the Invasion! 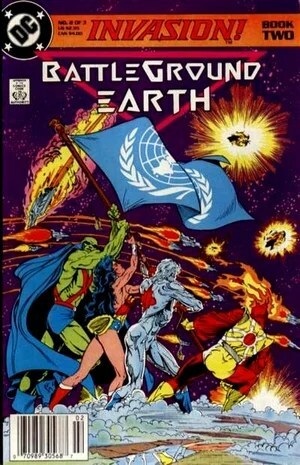 series (particularly in Book Two), as he is put in charge of Earth’s “super forces.” He first appears on the cover of Book Two (an homage to the Marine Corps Iwo Jima memorial) along with Firestorm (naturally), Wonder Woman, and Martian Manhunter. Earth’s super-hero forces have already suffered one loss. 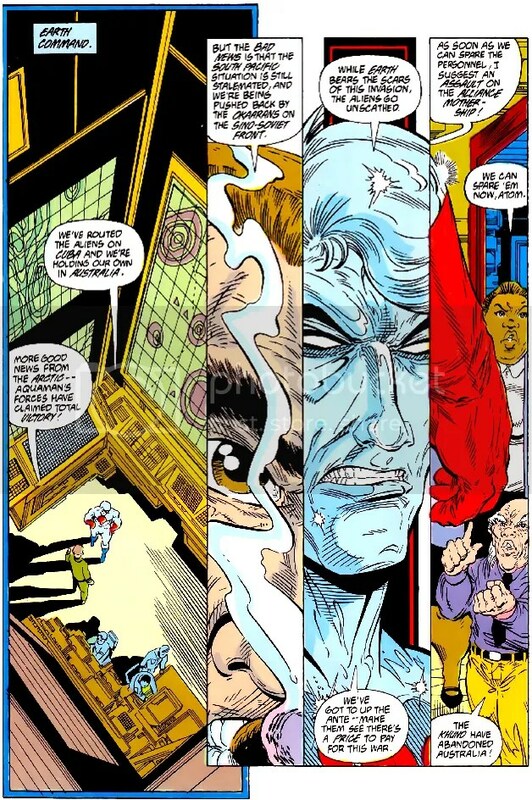 Celcius (Arani Caulder, leader of the Doom Patrol) was their first casualty. 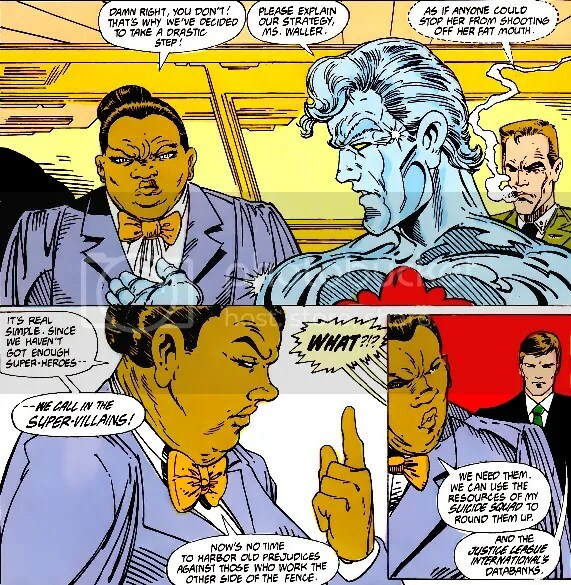 Captain Atom, General Eiling, and Amanda Waller meet with Earth’s heroes in Book Two. Superman has arranged a cease-fire with the aliens. Max Lord doesn’t understand why the aliens, who have vast numbers and superior firepower, haven’t just blown Earth away. 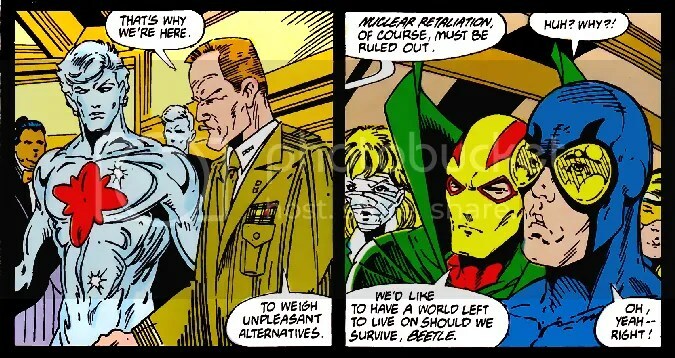 Not only can Eiling not use the world’s nuclear defenses, but he fears the aliens may have some sort of super-weapon to retaliate with if they did nuke them. They seem to have only one option. If they surrender Earth’s meta-humans to the aliens, the aliens will just keep coming back as new superheroes emerge. Hawkman and Guy Gardner want to fight. 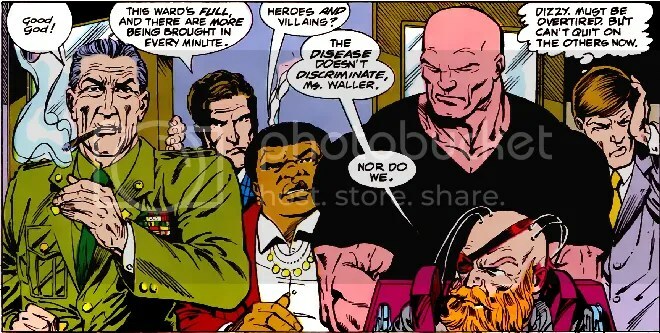 The heroes aren’t crazy about using super-villains to help fight but Amanda Waller can be pretty persuasive. Meanwhile, the Dominators are using the cease-fire time to resupply. They indicate that they are misleading their allies, who don’t know their true motives. In the ruins of Melbourne, Australia, the Khundian commander is impressed when he learns the meta-humans have arranged a sneak attack. Led by Superman, Earth’s heroes pour onto Melbourne, taking out invaders left and right. 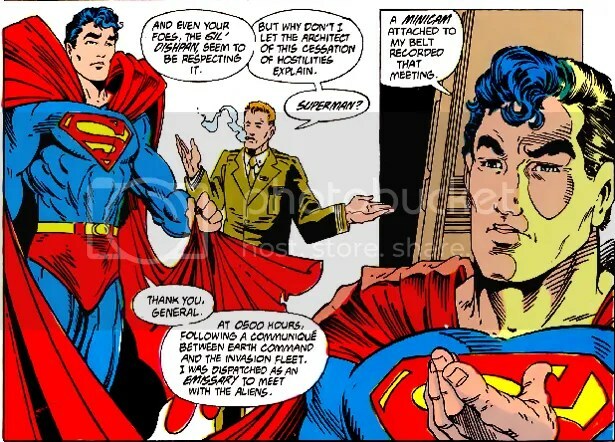 The Khundian commander tries to convince his Daxamite allies to use their new-found powers to take down Superman. 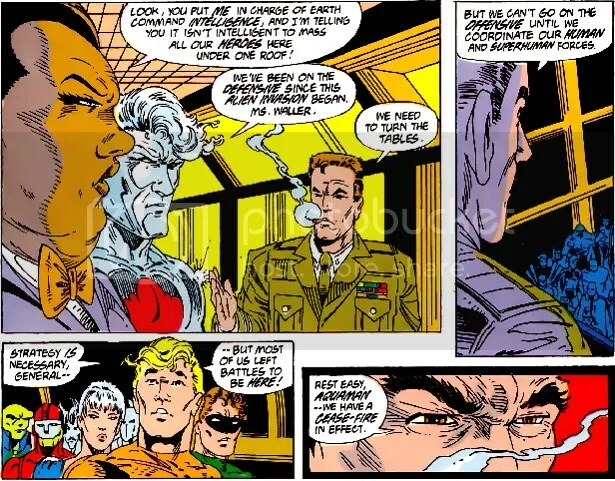 They agree, saying they will attack only Superman, that the Khunds must take out the rest of the meta-humans. The Atlanteans, led by Aquaman and assisted by the Doom Patrol, attack the Gil’Dispan. Firestorm and Green Lantern Hal Jordan attack the Khundian ships as the Daxamites make hamburger meat out of Superman’s face. There is a little scuffle between a Dominator and the Khund Commander’s fist. Khunds don’t like it when Dominators question their tactics (or outright accuse them of cowardice – the Khunds are like Klingons). 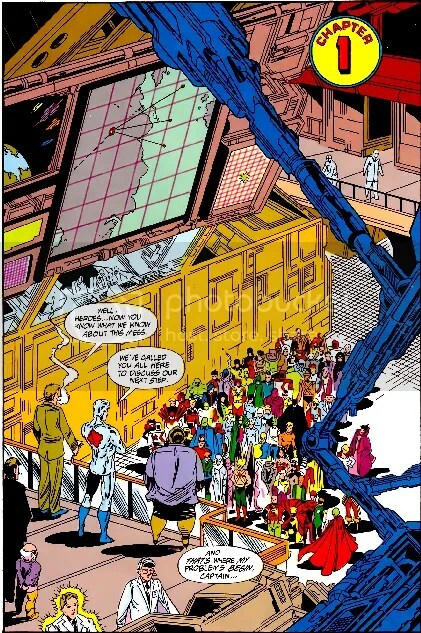 In the “vivisection lab” on the Dominator Spacebase, two Dominators are examining the Flash, saying how easily he was taken. They find something mechanical in the speedster’s chest and suspect it may be his source of power. No, it is a bomb, planted by Lex Luthor. It explodes. Spacebase destroyed. The Suicide Squad takes out the Khund reinforcements just as they arrive. High above Australia, the Daxamites suddenly lose their power and crash toward the surface. Superman leads the Daxamites to the upper atmosphere and they discover something was toxic in Earth’s atmosphere but now they are okay. The Daxamites, touched by Superman saving the people who were just attacking him, realize they may have allied themselves with the wrong side. 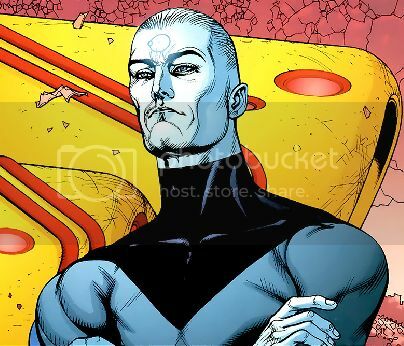 Across the expanse of outer space, a lone Dominator has identified the metagene; the so-called “superhero gene” from which almost all the heroes in the DC Universe derive their power. He has developed a “gene bomb” and heads for Earth. 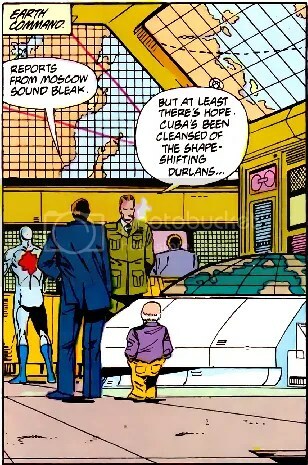 In Cuba, Manhunter and the Flash (not dead, the other Flash was a decoy) are laying a smackdown on some shape-shifting scumbags. Wally West’s dad sets off a bomb in Havana Harbor. On the moon, Green Lantern Guy Gardner indicates his mistrust of the Daxamites and other “stinkin’ aliens.” When Martian Manhunter points out he and Superman are aliens, Guy misses the point. Rioting at Starlag against the Citadelians ensues after Vril Dox slips aggression drugs into the food supply for a distraction. Along with Garryn Bek and a mysterious Durlan, he breaks into the maximum security block and frees the Omega Men along with a number of metahumans and other more powerful prisoners. The combined forces turn the tides against their captors. The Daxamite fleet arrives with a message of unmitigated support for Earth’s fighters. 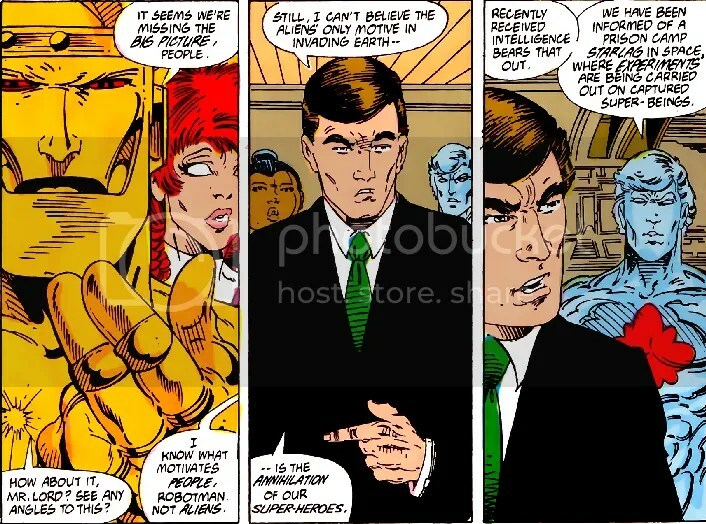 Proposing a new alliance, they announce that any attacks toward humanity will be interpreted as direct attacks on Daxam, and responded to in kind. With an army of super-soldiers each with the strength of Superman now on their side, the war turns irrevocably in Earth’s favor. Now pushing the offensive with their own personal cavalry, the Justice League rides through the enemy fleet and decimates them. All across the world, the tides turn and the fighting forces are able to drive back their enemies. The alien command deteriorates and falls to pieces as troops are forced to evacuate worldwide. A fraudulent transmission from the Martian Manhunter posing as a caste leader destroys any remaining shred of credibility for the Dominators. A call for surrender goes out across transmission signals, and the Alien Alliance is destroyed lest they risk further damage and humiliation. Determined to prevail regardless of their circumstances, the Dominators are prepared to unleash a doomsday weapon and simply obliterate the Earth until they strangely turn on each other, and kill themselves. 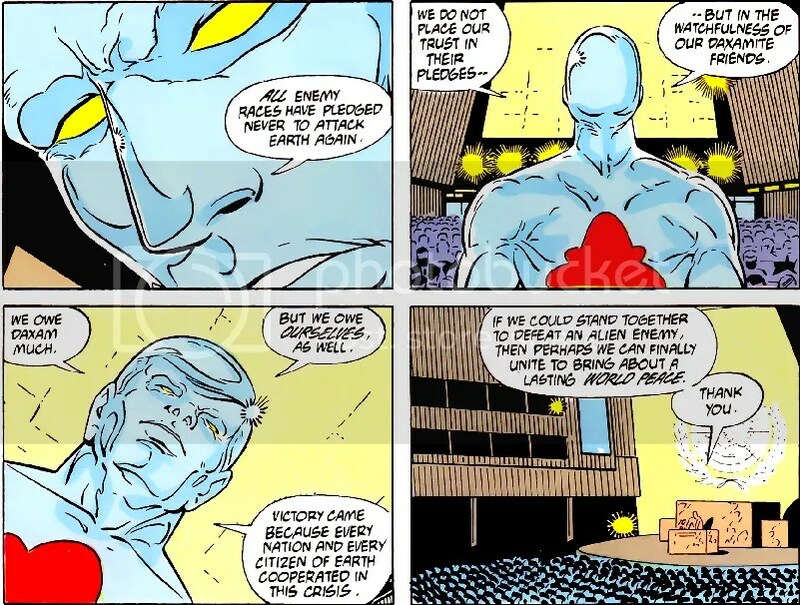 Deadman had infiltrated their leadership and been manipulating events all along. As Earth celebrates its victory over the defeated Alien Alliance, the Dominators fire off a parting shot. One of their scientists gone rogue had detonated the Gene Bomb. 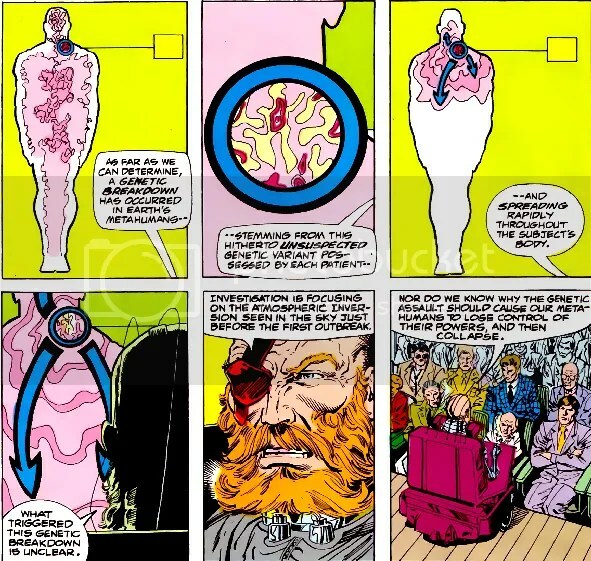 This causes all of the metahumans to go crazy, attacking their nervous systems and making their powers completely uncontrollable. 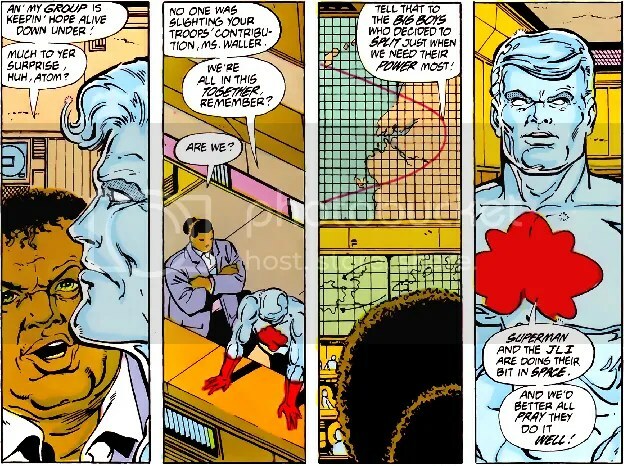 Captain Atom and Major Force begin unleashing nuclear energy in Manhattan, bordering on a complete meltdown. The Power Elite begin writhing in pain. 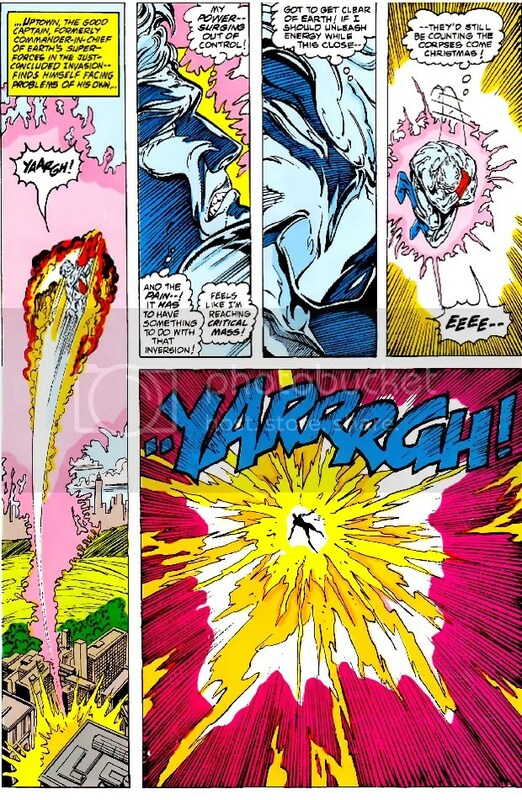 Firestorm loses control of the primal energies he contains, and the Rocket Red Brigade can barely handle him and Soyuz. 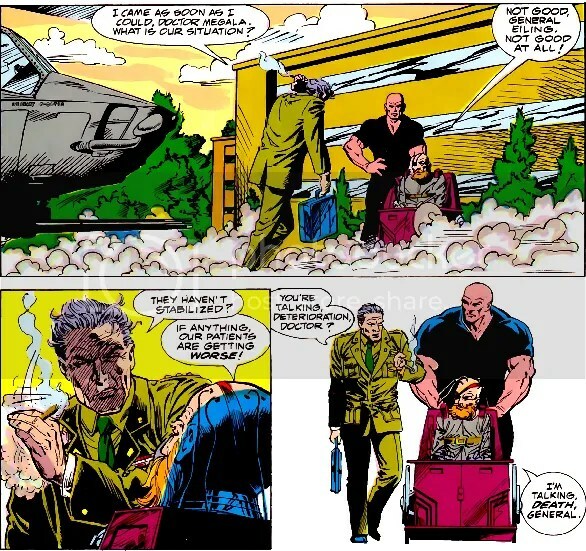 The Doom Patrol’s funeral for Celsius is interrupted by their own exploding powers. All across the world, heroes like the Flash, Elongated Man, Fire, Ice, and Black Lightning go berserk. Maxwell Lord is forced to accept the help of Lex Luthor in putting together a massive impromptu mediplex for all of the self-destructing metahumans. 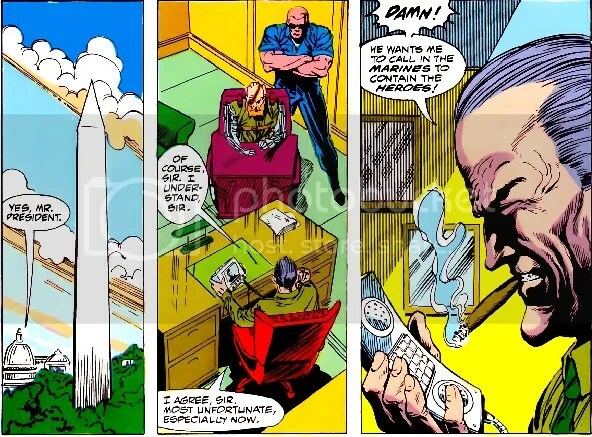 Ignoring a direct order, General Eiling contacts the Justice League International and allows them six hours to coordinate and bring their own problems under control before he’ll be forced to intervene. Non-affected capes across the world gather at the embassies to more effectively deal with the threat. It’s hero against hero as the Leaguers fight to contain their comrades. 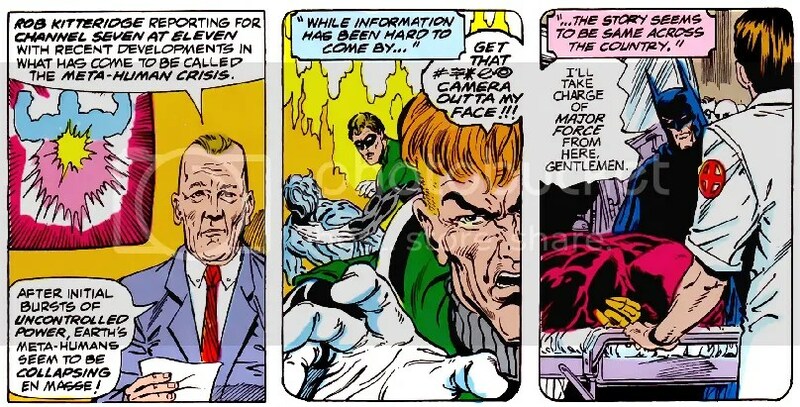 Green Lanterns Hal Jordan and Guy Gardner neutralize Captain Atom. Blue Beetle and Booster Gold neutralize Animal Man. Green Lantern Kilowog leads a task force against the New Guardians. Belle Reve, the supervillain prison, is completely overrun by its own inmates, and the Suicide Squad has to put down a riot from within. 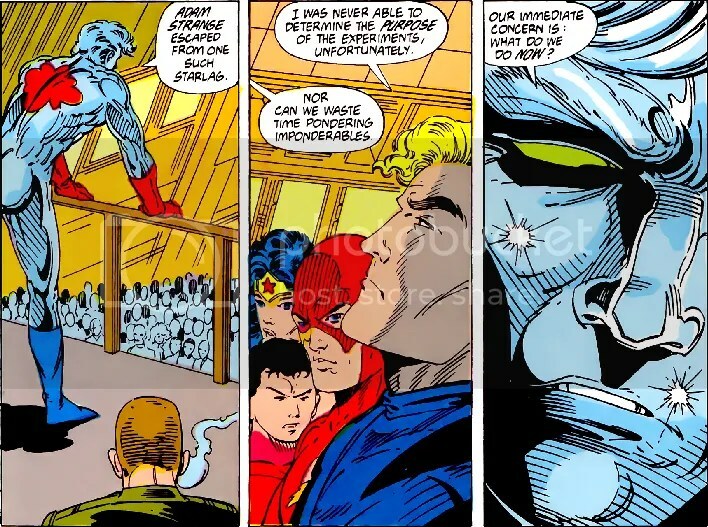 Manhunter has to take down the Flash singlehandedly. The Spectre fights Doctor Fate. Batman is called in to deal with Major Force. Martian Manhunter handles the Doom Patrol. Across the country, as stress levels run higher and the action heats up the media has difficulty providing coverage of the event. 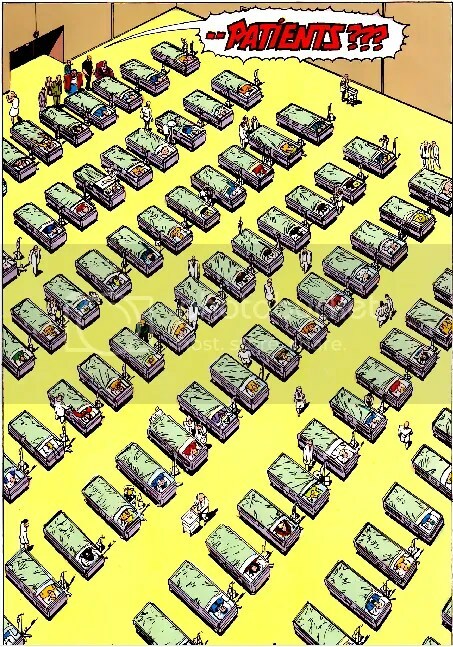 Criminals and supervillains take advantage of the power vacuum to rob and loot as much as they are able to, creating a nation-wide riot. 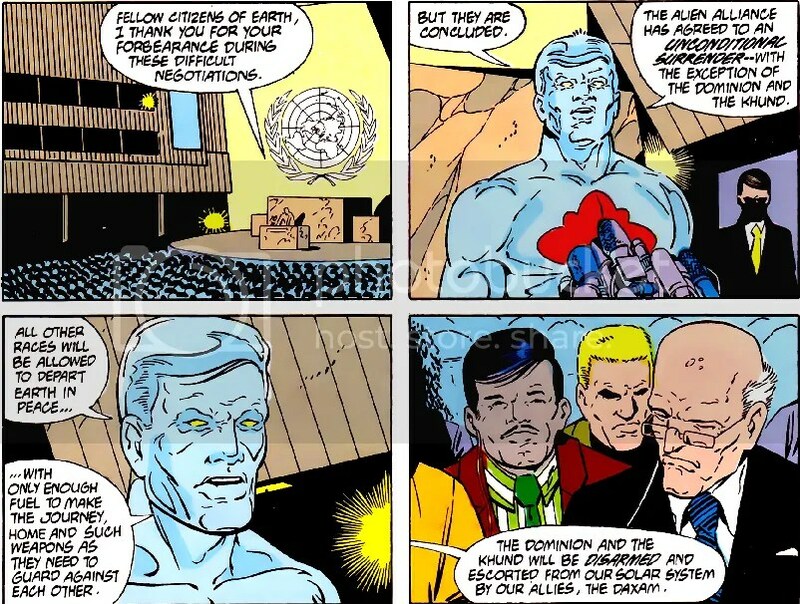 Interestingly, Metamorpho, deceased at the time, was resurrected by the gene bomb. Having recently escaped from Starlag, the Omega Men and the Blasters are rocketing back towards Earth. Tigorr wants a piece of the action. He bickers with Snapper Carr, who seems to have become the leader of his group. If they can’t find a cure for the metahuman virus, it could mean death for all of the infected. Scott Fischer succumbs to complications from his cancer. Top scientists are working around the clock to find a solution, but there is no end in sight. Their only hope is to find the creator of the virus and take the antidote from him. 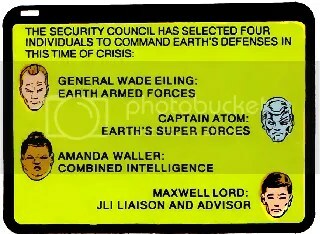 Earth Command launches a mission to the Dominion World composed of Green Lantern, Guy Gardner, Martian Manhunter, Robotman, Rocket Red, Starman and Superman. They are to perform a covert operation, ascertain the whereabouts of the alien scientists responsible for the bombings, and come home with an answer. Along the way, they pick up help from the Blasters and the Omega Men. It’s a daring counter-invasion into enemy territory. The ship remains cloaked, but they are in danger of being caught by the Dominators at any time. Martian Manhunter and Robotman are teleported down in disguise by Snapper Carr. On the planet, they discover that the scientist responsible for the Gene Bomb is considered a renegade, and is being imprisoned for disobeying the higher caste. They believe he has destroyed the metas forever, making them useless to further exploitation and experimentation. 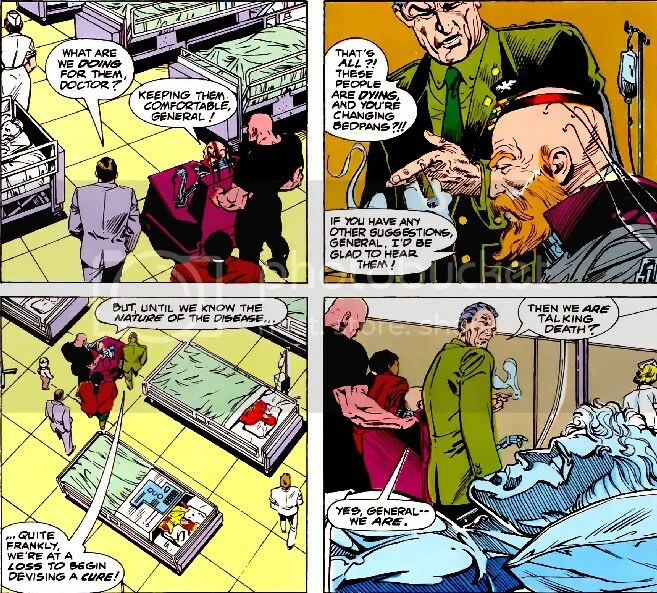 Sneaking into the holding cell where the scientist is being tortured, Martian Manhunter simply steals the secrets of the antidote from his mind. 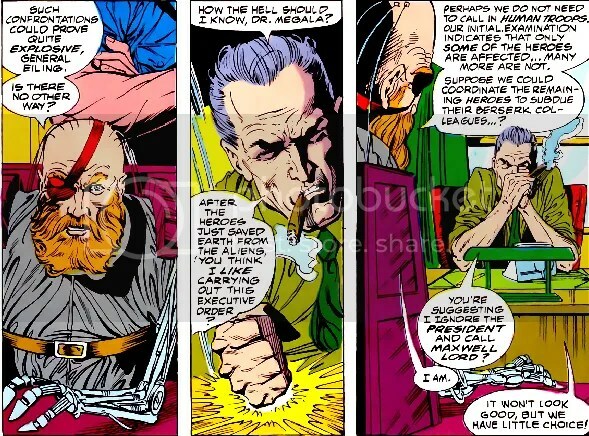 He is able to bypass security by shapeshifting into a higher caste member and anticipating responses using telepathy. They are not so lucky in escaping. As soon as the ship begins to leave, they are spotted, and retaliatory spacecrafts are sent out to destroy them. These are thwarted by the heroes onboard. There’s only one way to put the ingredients together, unfortunately. A Dominator laboratory is needed, and the only available one is on Starlag, right where everybody recently broke out of. It is still heavily guarded by the Citadel warriors, and the team must fight their way through swarms of them to get through. J’onn and Doc operate the machinery. Now that the heavy hitters are in charge, crowds of Citadellians go down in the battle. They finish, racing against the clock, and leave as they see Khunds approaching in warships. As the heroes blast away, the Khunds obliterate the Starlag with their weaponry. Back on Earth, General Eiling and Doctor Megala lament their current situation. After all the heroes did to save humanity, humanity couldn’t save them. There are mere hours left, and this is surely the death of hundreds of the world’s greatest champions, shot down from glory in their finest hour. Knowing that he will have to give the press release telling everyone the government failed, Eiling is getting himself drunk. In space, the returning heroes arrive just in time. In the same manner the virus was distributed, they spread the antidote through the atmosphere. Superman ignites it like a bomb and lets it rain down over the planet. 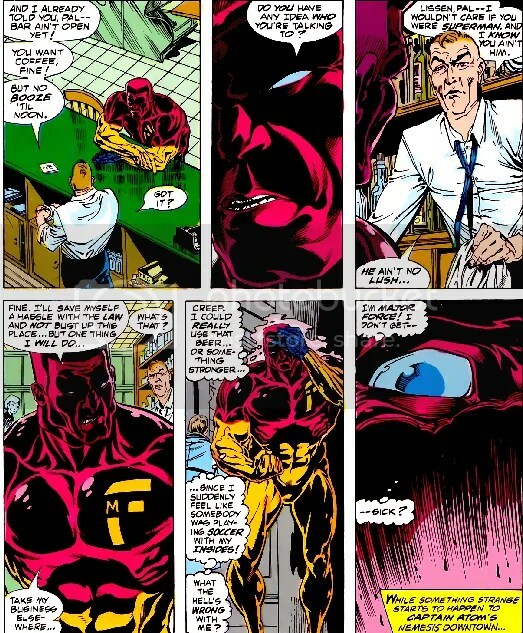 As Eiling is grimly delivering the news to the media, word of the cure reaches him, and he smiles before dismissing everyone hurriedly. The next day, Perry White is proud to publish a new edition of the Daily Planet, with a headline that everyone can rejoice to. It is a new morning, and humanity’s protectors are there to safeguard them into tomorrow. The papers read Rebirth! Earth’s Heroes Cured!